A challenging hike for walkers unused to much rock scrambling, and not one I’d recommend in wet or hot weather, but good views and a real sense of accomplishment at the finish make this a worthwhile day hike. Time: Approx 4h 50m (included a 20min lunch break). Moving time was 2h 30m. See also: Parks Victoria Map of Cathedral Range State Park which is very detailed. We first attempted this circuit in September 2010, having picked it out of John Chapman’s “Day Walks Melbourne“, probably because it looked interesting and slightly adventurous. Or possibly because it was located near Marysville, where I’d never been, and Stephen hadn’t been since the devastating Black Saturday Fires in February 2009. Or maybe we were simply enticed by the photo of two hikers looking over the range from Sugarloaf Peak featured on the books’ cover, which belies the challenges and amount of effort required to get to that point. Me atop Mt Sugarloaf. The view in this shot is similar to that on the cover of Day Walks Melbourne; there’s little indication of the challenges faced to get to this point – from either direction. 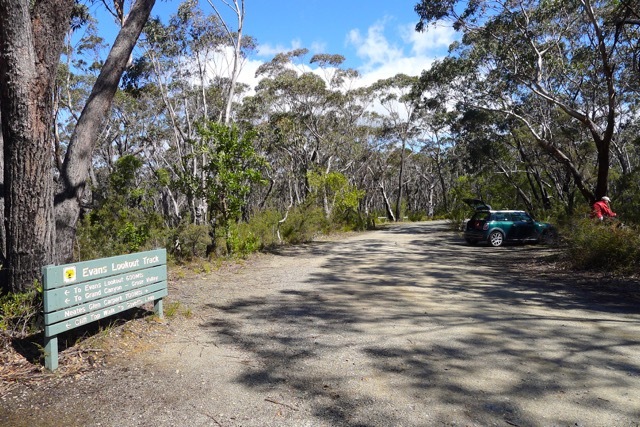 In our first attempt, we drove up Cerberus Road to Sugarloaf Saddle (apologising to the MINI as usual for asking it to be a 4wd) and walked up Canyon Track. 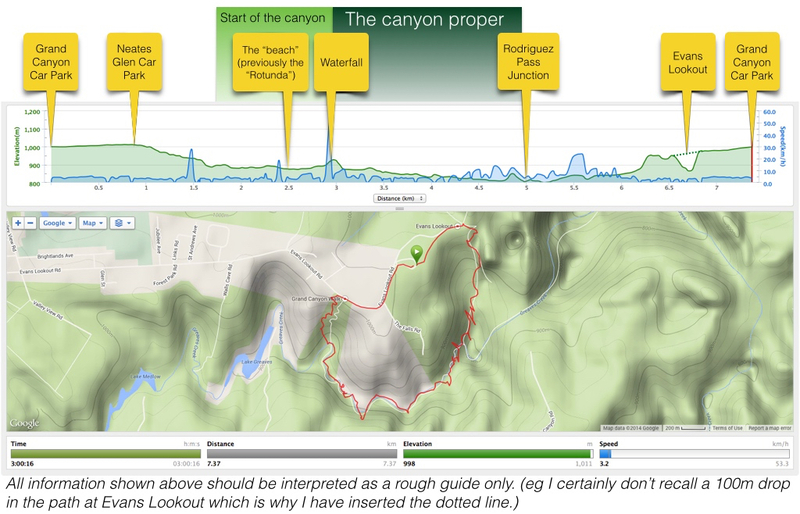 John Chapman’s brief description of Wells Cave Track was enough to make us think the ‘easy’ option was more our level. 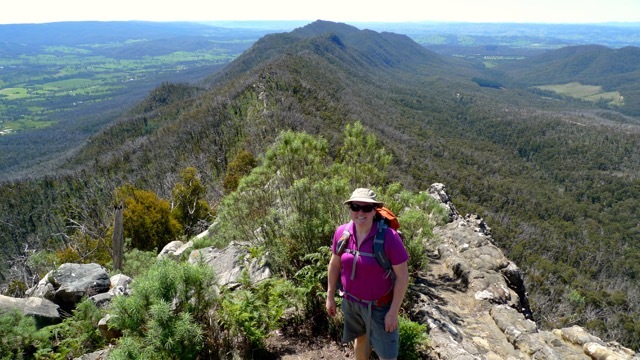 We followed his advice and ‘scrambled carefully’ up the steep hillside, the gullies and terraces proving not overly challenging until we came to what I believe he refers to as “a short climb to the right lead[ing] to the summit of Mt Sugarloaf”. Which is where we got stuck. And this is how it looked. Now, we’re not the only ones to have fun here. I’ve just read Greg of Hiking Fiasco’s account of his ascent (with a full backpack containing camping gear, mind you!) and he ratchets the difficulty rating of this walk to a level above merely ‘hard’. No wonder! So, finding ourselves somewhat confounded – we’d never had to abort a walk before! – we retraced our steps, drove back to Jawbone Car Park back down the road and walked up to South Jawbone Peak instead. 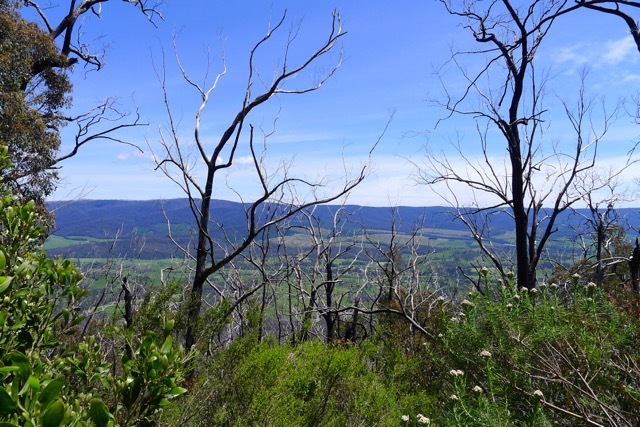 At that time it was only a year and a half after the Black Saturday fires when 92% of the park was burnt; it was very clear the greening bush still had a long road ’til anything near ‘full’ recovery. For the last four years the memory of this failed walk has been at the back of our minds, nagging away. Almost every time one of us (ok, usually Stephen) suggests we go for a bushwalk, more often than not Cathedral Range has been offered up. Like that thing you borrowed and have been meaning to return to whatshername for yonks, you almost get used to living with the guilt of still having it hang over you. This weekend was finally it. The conditions were pretty prefect – not raining, not too hot, not too cold, fire risk seemed reasonably low. When it came to it, there was just one fly in the ointment… my legs. Despite the legs, I felt that this was our chance to get this walk knocked over, struck off the list – and I didn’t want to be the one providing the excuse not to go yet again. Especially after I’d told everyone that this is what we were doing this weekend! So Monday morning we made lunch, packed the car and off we headed. 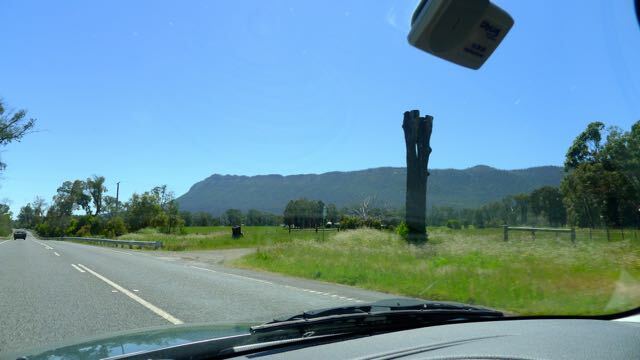 It’s a lovely 2hr drive from our place through the Yarra Valley to Cathedral Range State Park. I used the time to try to warm up my stiff and aching legs (and gluteals) – the benefits of being the passenger. Unsurprisingly, we found Cathedral Range right where we left it; tall, long and distinctive, though a bit tricky to photograph well from the road due both to the length of the range and the trees growing along the roadside. The turn into Cathedral Lane from Maroondah Highway is at the northern end of the range and is marked with the usual brown sign for places of interest. The graded dirt Little River Road (that runs alongside Little River) is reasonably well graded – but mind the potholes. Dirt road start here. Watch for potholes. 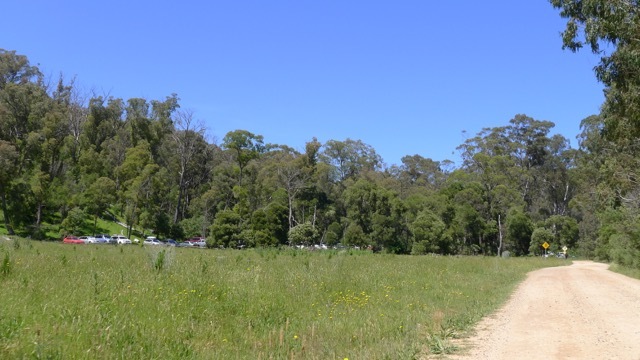 We were somewhat surprised to see the large number of cars parked at Neds Gully car park (we didn’t realise at the time that there is a camping ground across the creek) and there were also plenty of people parked and camping around Cooks Mill. Apparently it’s a popular weekend for coming to the park! Navigating solely by memory (naturally the book was in a backpack in the back of the car) we turned right at the campsite and headed uphill to Jawbone Car Park. By now it was almost noon – despite my crossed fingers, we weren’t the only there. Given the numbers of people we’d passed, it wasn’t really a shock. The Mini blended in perfectly with the other cars. Slowly changing shoes for hiking boots (while at the same time, going as fast as I could manage) I heard three or four groups come and go – mostly young families. Concerns about how busy the walk was going to be started to fill my mind – was the car park just an indication of the traffic on the track? Yikes! The bridge marks the last downhill section for a good while. Although the climb up to the Farmyard is step, the path is very well made and if you take your time it is a very pleasant walk. I’m afraid I didn’t take too many photo’s along this section. On countless occasions Stephen has probably wished that I’d stop taking photos and hurry up. Well I’ve found what will limit my compulsion to stop and click: pain. Unfortunately that also meant my average speed wasn’t any faster than usual! There was so much I didn’t stop for, too. November is a good time to see lots of flowers in bloom. 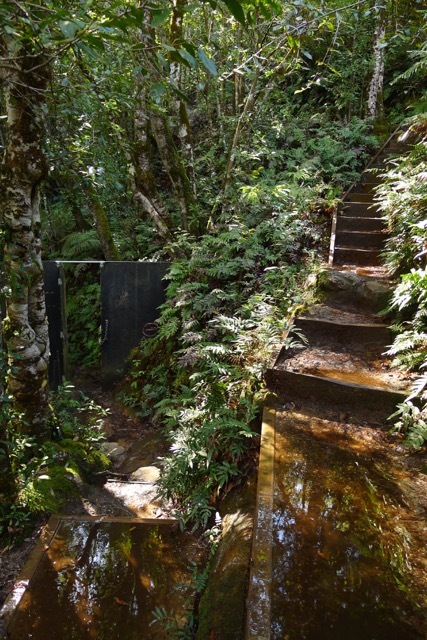 The walk up to the Farmyard probably has the best number and variety across the whole walk, since it’s quite a damp and sheltered gully,with Jawbone Creek even supporting tree ferns to grow near the top. A sign at the top of the gully directs you to turn left here to continue on to The Farmyard. Another walker had caught up to us at this point. He looked like he’d taken a wrong turn to a running race and somehow ended up on the mountain with only his drink bottle, but when we got to the next clearing and he ducked into his tent that blended in so nicely with the surrounding vegetation I completely failed to see it on approach, I began to think maybe I shouldn’t be so quick to judge. You are allowed to camp here, and if you want a bit of quiet and/or privacy and don’t mind lugging your gear all the way up here it’s certainly the way to go. He was the only person camping in this first clearing where there is another track leading to The Cathedral. In the next clearing there was also a single tent. 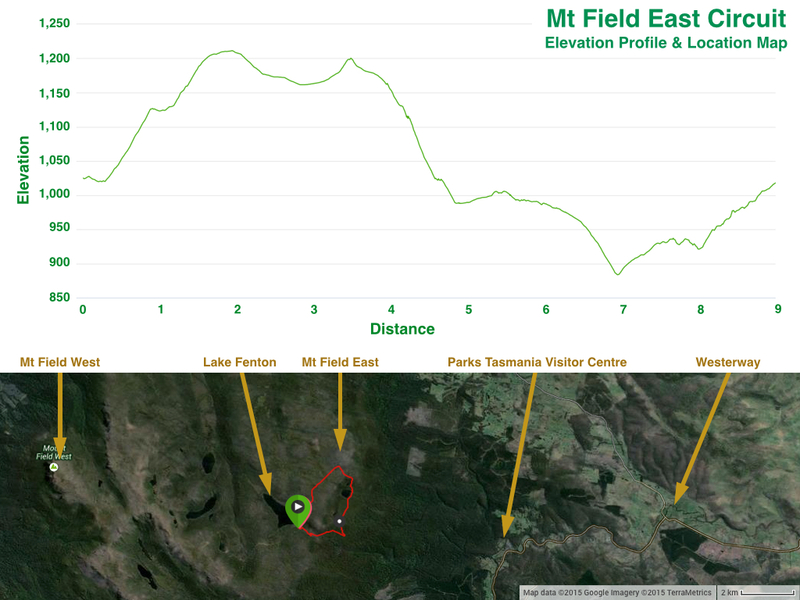 If you’re interested in climbing South Jawbone Peak, the track starts at this second clearing. When you enter the clearing from the north there are three tracks to chose from. 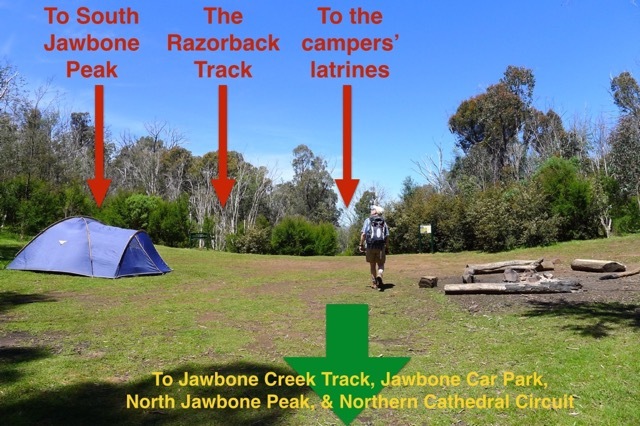 On the left is South Jawbone Peak (sign posted), the middle one is The Razorback (also sign posted) – not, as I initially thought, an alternate route to South Jawbone – and the track on the right (which is roughly straight ahead as you approach) is actually the track to the latrines. No, not long drops, the unofficial latrine area used by campers. It wasn’t the smell that gave it away (at least, I didn’t smell anything); the tell-tale signs were toiletpaper and other non-biodegradable rubbish lying around. Goodness people! Dig deeper holes! Ladies – take liners and packaging home with you to dispose of, please! Beating a hasty retreat we tried again, taking the middle path this time. The Razorback Track undulates relatively gently at first (lulling you into a false sense of security) as it follows the ridge line south through fairly dense young trees and shrubs regrowing on the ridge after the fire. By now my legs had warmed up a little, but still seemed reluctant to handle anything but an incline with anything nearing a modicum of comfort. Occasional glimpses down into the valley are obscured by burnt, dead trees; in the five years since the fire their charcoaled limbs haven’t yet fallen to the ground and they remain reaching, stark and barren toward the bright blue sky. It’s quite clear that the path is well used and it’s simple to follow for the most part, but there are numerous orange triangle track markers along the way to ensure walkers don’t get lost. Indeed, it’s easy to think that Parks Victoria have put a whole year’s allocation of these markers just in this one park. (Maybe that’s why they’ve had to resort to carving blobby arrows into the signs at Wilsons Prom?) However, the further we walked, the more reliant on these arrows we became. I lost count of the number of walkers that passed us going the other direction – young and old, all evidently following the generally recommended route. How had they climbed up the section that defeated us four years ago? Had we missed something – was there a way around that bit that meant retirees were seemingly able to do this circuit yet we couldn’t? What was going on? As with almost all our walks where we pass lots of people, the general state of attire seems to be ‘casual’; limited water, basic footwear, and no extra clothing discernible. 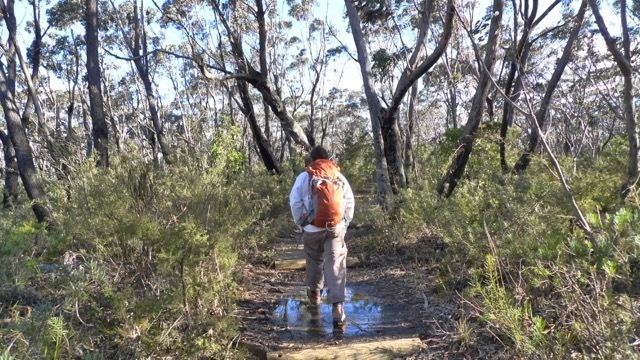 How do people go for a bush walk so unprepared? Walking along the ridge you really appreciate why the range is described as ‘sharply upturned sedimentary rock’. In fact, it reminded me of crunchy sand at the beach – the type that fragments into pieces as you break the crust. Only these rocks were formed from sand/silt in the Devonian period, a few hundred million years ago. No wonder they’re a bit harder than the crusty sand bits on the beach. Don’t get too excited at the sneak peaks you get back over the ridge – soon enough you’ll have plenty of opportunity for looking around as you really start climbing. And there’s still plenty to see around you. Nodding Blue-lily I think. I see these plants in median strips along St Kilda Road, Melbourne. Their flowers are very distinctive. Sugarloaf Peak, being the highest point along the ridge, is tall and narrow and sticks out like a sore thumb. But we were too busy looking at the view behind us to pay much attention at first of what was ahead. I had in my mind that the ridge was pretty flat – that’s certainly how it looks from the main road – and the real challenge would be getting down that tricky bit from last time. 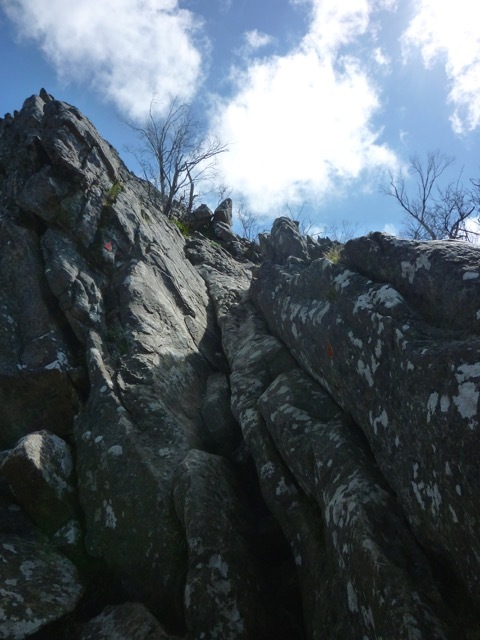 But as we kept climbing and clambering over increasingly large rocks along the ridge line, the peak in front loomed ever higher. It even got to the point where I put my camera away so I could focus on climbing properly instead of worrying what it might be banging against as I held the strap between my teeth. That may be fine for short diversions, but when you’re combing what is essentially a rock wall – it’s better to keep the camera somewhere safe. We didn’t re-read the track notes or anyone else’s blog posts about the walk before setting out (at least, I didn’t) and on reflection I’m really glad we didn’t. 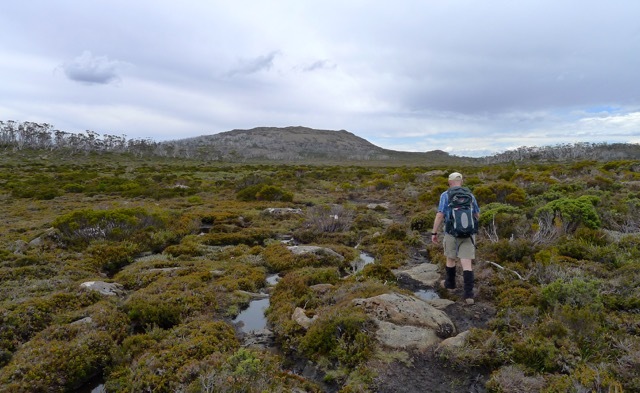 Although John Chapman certainly doesn’t make it sound scary, had I read Greg’s Hiking Fiasco post or Neil’s Bushwalking Blog (plus the mention in his Northern Circuit post) post on this walk, there’s a very high probability that we’d never have tackled this walk. Putting something in the ‘Too Hard’ basket is a very convenient excuse not to accept a challenge. As it was, I’m left to reflect the marvellous ways we try to kid and talk ourselves out of something we don’t really want to contemplate even when it’s right in our face. “I wonder what mountain that is?” became, “Is that part of this ridge?” which lead to, “Surely we don’t have to climb that?!”. Inevitably, the reality of the situation is accepted and you admit to yourself that yes, indeed, that shark’s fin of some “Sharply upturned sedimentary rock” IS part of the track, and what’s more, “Yep, the track goes straight up”. Don’t forget to follow the orange triangles! There’s one place where it looks like the path leads down, but as far as I could see from the ‘junction’ it doesn’t go anywhere. Keep following the markers straight up. I knew we were almost there when I saw someone else at the top. We knew had made it when we got our cameras back out. Wooo! Now, about this down bit…. Once you’ve had the freedom of two hands (or maybe it’s just that the path down quickly requires both hands again) the camera was soon back in the top pouch of my backpack, only withdrawn for a quick photo here and there. The people we saw at the top were a group of three young hikers, who started back down shortly after us. I have to say I welcomed their company on this section because they clearly managed to get up – maybe they knew a better way down, or at the least, if we got stuck it was more people around to help out. Unexpectedly, getting down the next rock was almost the trickiest of the day! It’s a bit of a drop to the next level, and I have only vague memories of climbing up there last time. I tried to feel for a place to put my foot as I held onto a rock on the side and a tree root, but instead I ended up sliding down on my belly. It was only a drop of about 20cm – if that. I ended up with a tear in my shirt where it got caught between buckle and rock, but the others chose to slide down on the bums. Could be the better option. From there it’s more or less plain sailing. My legs were still not properly programmed for descent, but otherwise hiking as usual. It took us about 4 hours to get to the rest area at Sugarloaf Saddle where there is a pretty fancy new covered picnic area where we ate lunch. There are toilets nearby (best to take your own toilet paper) and a car park. 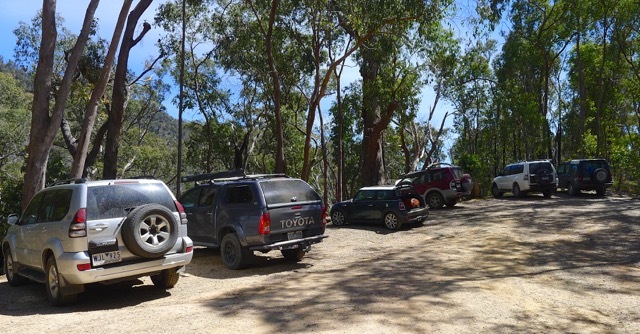 Sep 2010 – Sugarloaf Saddle Car Park. The toilets were just being built. Backpacks on again, Stephen took off and I hobbled after him, my legs quickly seizing up in our relatively short (but late) lunch break. (Why people chose to walk up Cerberus Road instead of down it is beyond me.) Downhill was not much fun, but by the time we made it back to Jawbone Car Park (a couple of kilometres later) I felt I might be loosening up a bit. Just in time for a 2hr drive home. In all it was a really good, if challenging walk, and we’ve both come away with a sense of accomplishment. I’m glad it wasn’t any more challenging as there were a couple of sections there that we only just found a way to climb up or around. We’re not in a hurry to do the Southern Circuit again. Other bloggers seem to rate the Norther Circuit as about the same but without a slightly lesser degree of rock climbing/scrambling. One day we might even pluck up the courage (or have forgotten enough details about this one) to go and check it out. 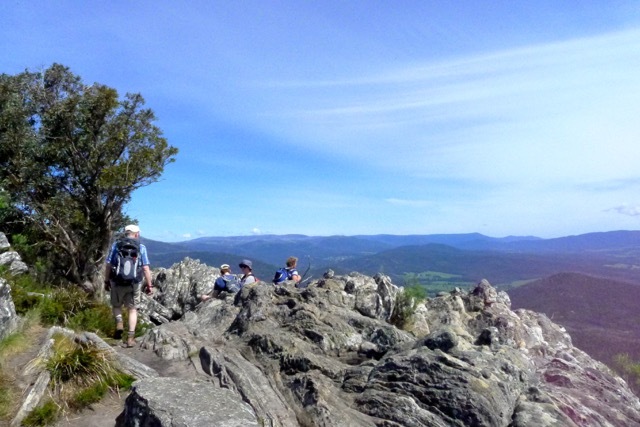 Categories: Hike, Victoria, Weekend walks | Tags: bushwalk, bushwalking, Cathedral Range, day walk, Devonian rocks, Hiking, Marysville, Melbourne, Parks Victoria, Razorback Track, Victoria, wildflowers, Yarra Valley | Permalink. 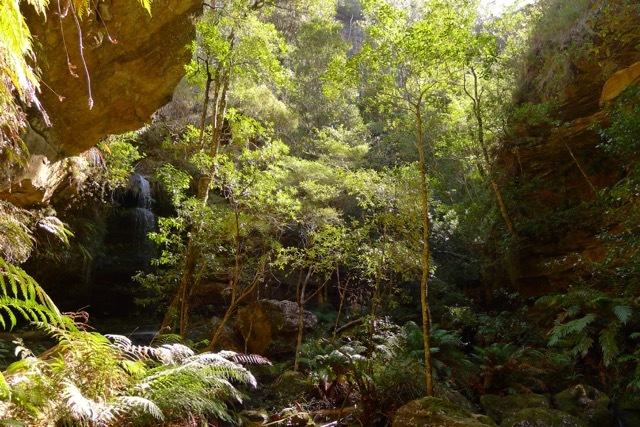 A spectacular walk showing off the contrasting habitats, magnificent geology, and spectacular scenery of Grose Valley. This walk contains many stairs, potentially slippery surfaces and a short tunnel. Check conditions at the Blackheath NSW Parks Information Centre if there has been recent heavy rain and, as always, be aware the day’s fire danger rating. 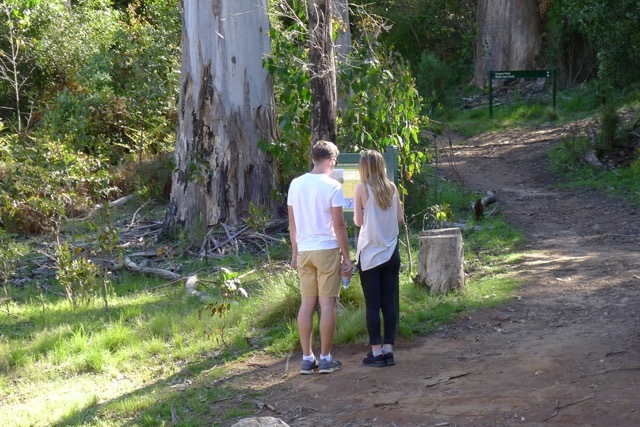 Following our successful early morning walk to Leura Forest (by successful I mean we started and finished before noon!) we were primed for an afternoon walk to pack in as much as possible on our last full day in the Blue Mountains. Even though there were still walks around Katoomba where we were staying (eg Wentworth Falls), if it meant a drive in the car we thought we may as well see a different valley altogether. The Grose Valley is a very large, long valley to the north of Katoomba. There are many walks dotted on our SV map near the town of Blackheath, situated at the western end of the valley. 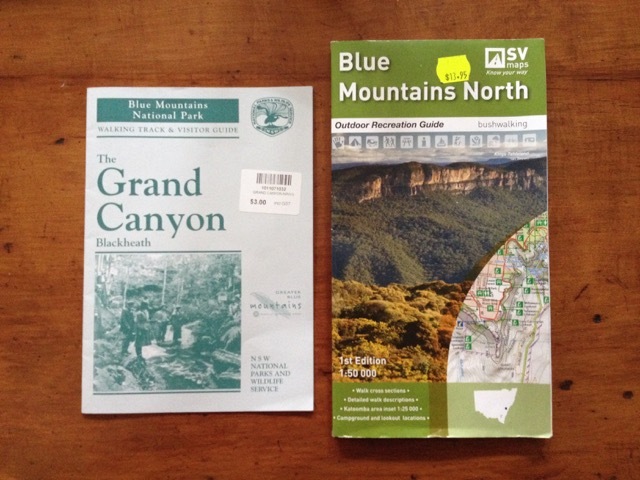 The Grand Canyon is briefly described on that map, but we also bought a much more detailed Walking Track and Visitor Guide solely on the Grand Canyon walk from the Echo Point NPWS Information Centre (and at $3.00 you can’t quibble at the price). Blackheath is an easy 10min drive up the road (west of Katoomba). 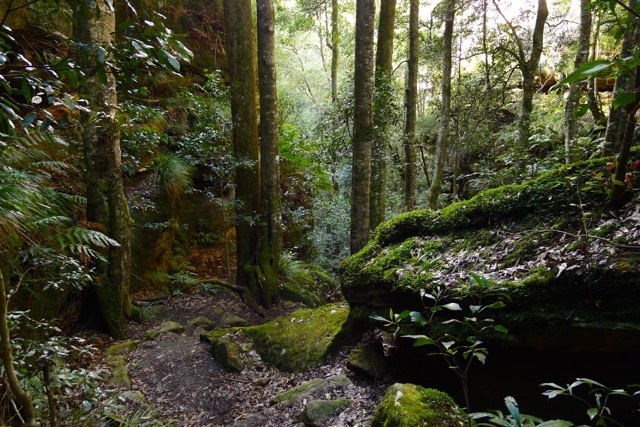 The turnoff to this walk is before you get to the actual township, if you’re coming from Katoomba like us. There are signs, but keep your eyes open all the same as you get close to the town. Following the instructions in the NPWS booklet, we parked in the Grand Canyon Loop Car Park (the second of three car parks) near the end of Evans Lookout Road. Somewhat surprisingly, there was another car in the first (Neates Glen) carpark, but no one else in the second. Judging from the number of car spaces available, this area can be pretty popular sometimes. Once again I found myself thankful it was a weekday, and not during school holidays. On the other hand, it’s no stretch to imagine how an uncontrolled bushfire could race through and decimate communities living here – human, plant and animal. With our climate changing leading to the frequency and intensity of fires increasing, even communities that are fire tolerant will come under pressure. The path leading back up to the first carpark (Neates Glen) was easy to find. There’s a very gentle incline on the path between the two car parks to the start of the proper Grand Canyon track. But pretty much as soon as you turn into the bush you’re walking downhill, increasingly steeply. It was only early afternoon, but the shadows on the western side of the ridge felt cool and welcoming as we dropped below the ridge line. The undergrowth becomes softer, and it’s not too long before we came to the first set of doors across the path. Doors? What on earth are these for? To keep walkers out of areas affected by flooding, apparently. A good idea, but I wonder if the Rangers are sent to close the doors before or after the rain ? Stepping through the first black door was like passing through a portal to a parallel universe. 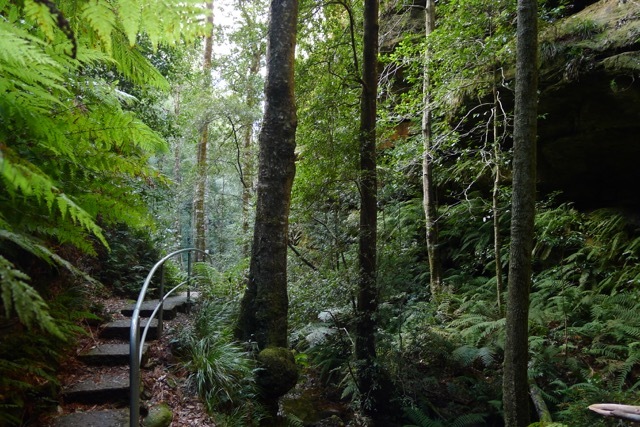 Almost immediately the vegetation becomes lush – not just beside the path – completely surrounding you, as you carefully make your way down the rock and concrete steps. There is water trickling over the path, down the boulders next to you, off every piece of moss and fern frond, after having been filtered through and slowly released by the hanging swamps above. 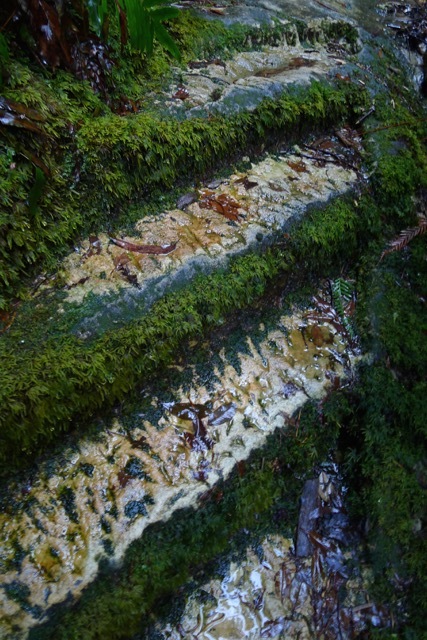 Looking down to check my next step, I was amazed at the volume of plant life growing on the vertical rise of the step – in fact, there are ferns and mosses growing on every millimetre of surface that’s not regularly trodden, by the look of it. Too soon the narrow gully widens and we found ourselves in a small valley. I thought at the time that these cliffs towering up to 100m above formed the ‘Grand Canyon’ referred to in the title of the walk… but this is just the start. While nowhere near as large as the ‘real’ Grand Canyon in the USA (not even a speck compared to that) it is still impressive as you cross Greaves Creek for the first time and follow the canyon (aka gorge) down to the valley floor. It’s not far before you reach the end of this upper, open section of the canyon, where a flight of stairs takes you down a level to a place known as the “beach”, I guess due to sand deposited here over time by the creek. It used to be known as the “Rotunda”, and was quite a popular spot. It’s not hard to see why. The afternoon sun was just at the right angle for a ray of light to pierce through the canyon onto the stream and yellow sand of the creek bed, illuminating the canyon wall with a dancing, golden light. Maybe this is what’s given the ‘beach’ it’s name? Tearing myself away from this fascinating area, we came upon the tunnel. In my brief scan of the NPWS notes over lunch I hadn’t noticed anything about a tunnel! So it turns out it’s only about 5 metres long – but not knowing that I was happy for the torch. No, we didn’t get out and re-read the notes (also in Stephen’s backpack), but in case you’re wondering, it’s simply described as ‘a short tunnel having been formed by a rock fall’ and walkers are warned to “watch your step (and your head) as the floor of the tunnel is rough”. I didn’t notice it was particularly rough, but then – Stephen had brought a torch! Before you, after you exit the tunnel and walk down the steep stairs, is a… bowl? basin? a gigantic pothole ground out by a million seething swirl pools of debris after eons of flooding? I’m not sure how to properly describe the large round space. The middle of the floor is filled with large boulders and a few trees, while ferns and other plants grow down the sides of the canyon walls. The path continues to hug the canyon wall on the right and, by so doing, leads you under a waterfall that feeds Greaves Creek. It wasn’t flowing very strongly that day, so the only reason I got just a little wet on the shoulder was because I had to wait for Stephen to be satisfied with the photographs he was taking. But fair’s fair – it was his turn next! Entering the canyon proper I was awed by the rocks, shaped by the passage of water over millennia. The NPWS booklet explains the canyon is formed from what’s known as Burra-Moko sandstone. Not only does it look different to the Banks Wall sandstone that is widely recognised from photos of cliffs (most notably the Three Sisters) in the Blue Mountains, but it’s a softer sandstone, too. The creek disappears from view down into the narrow, dark depths of the canyon. Ferns line the sides of the canyon walls, using any crevice, crack or ledge for support as they unfurl their fronds to catch the limited daylight – and the constant drip of water from the hanging swamps above – entering the confined space. Green plants and huge rocks…can it get better? Walking across the scalloped side of the canyon, and through the cuts gouged into the walls made by the creek (some places deeper than others) I marvelled at the power and beauty of nature. For someone who loves rocks (in a forest setting), this was a place I could have only dreamed of prior to now… In short, it was fantastic. Just before you descend to the valley floor, the canyon widens and the path transects some scrubbier forest on the hillside. The opposite side (much more of which is now visible) is topped with tall and straight eucalypts, silvery in the fading afternoon light. So glad there’s a sturdy bridge here! Thanks NSW NPWS! Yes, another gate, even here! Although it’s still only mid-afternoon, when you’re down this low in the protected canyon it feels a lot later. The light is fading quickly so we’re trying to hurry, yet at the same time at almost every turn there is a new sight to take our breath away. Turning a corner and entering the gully that would reunite us with Greaves Creek, my immediate impression was that this would be just the sort of place to find elves (the benevolent kind); mossy and green, and perfectly arranged. As mentioned, there hadn’t been all that much rain lately; while there are a few small sources of water feeding into Greaves Creek along the way, it’s just enough to keep it flowing. The deep, dark pools of water are calm and cool. I wouldn’t be surprised if there are leeches in the water though, and drinking from the creek is definitely unsafe without sterilisation. There was no chance of getting our feet wet as we crossed the creek a couple of times on perfectly spaced stepping-stones as we followed the track down to the intersection with Rodriguez Pass Walking Track. The NPWS notes warn that you may have to look carefully in places to follow the track; this might be the case when the water level is higher, though we didn’t have any problems following it. The size of the tree trunks lying discarded in, or propped up against the walls of the canyon are evidence of the power of past flood events. It looks like it’s been a while since the last big flood. Or maybe they’ve fallen down from above… either way, I’m glad everything was quiet as we walked through. The logs there have a reasonable covering of moss, and there are plenty of young trees and ferns growing the canyon floor. Near the track junction the creek forms a very small waterfall as it enters the roof of a little cavern and fills a pool with a sloping edge of fine gravel (almost sand) by the path that looks absolutely perfect for a quick dip. Lucky it wasn’t a particularly hot day or I might have been tempted to stick a toe in. Or simply walk in, boots and all! Rodriguez Pass Walking Track will take you into the middle of Grose Valley before exiting at Govett’s Lookout. Had we started this walk at 8am then this may well have been the route we would have taken. It would mean an extra 6-7km (at a guess – I haven’t got a map that tells me exactly) which I expect would take about 3hrs (definitely allowing time for photo opportunities!) plus a lunch break. After the intersection it’s pretty much all uphill back to the car park. As Stephen is known to sagely remark, “What goes down, must come up.”. Take heart in knowing the climb out is not as steep as any of the ‘Staircases’ we’d climbed in the last couple of days, because (for once) the track leads up a sloping gully to the cliff top instead of trying to scale the cliff itself! After climbing Giant Staircase that morning the climb out did seem to go on and on… and on some more, but on the other hand, it had been a lovely, long stroll to the bottom. The air was already beginning to take on its evening chill; very pleasant in summer, but I imagine it can get really cold in winter! To begin with you’re still surrounded by lush forest, down on the valley floor where streamlets feed into Greaves Creek. Further up the gully the undergrowth thins out allowing a better view of the moss-covered trees and rocks along the path and the huge boulders and cliffs behind the reaching skyward. With every step (and there are a lot of steps!) the mossy forest gets a little drier until there are just a few trees below two very large boulders. 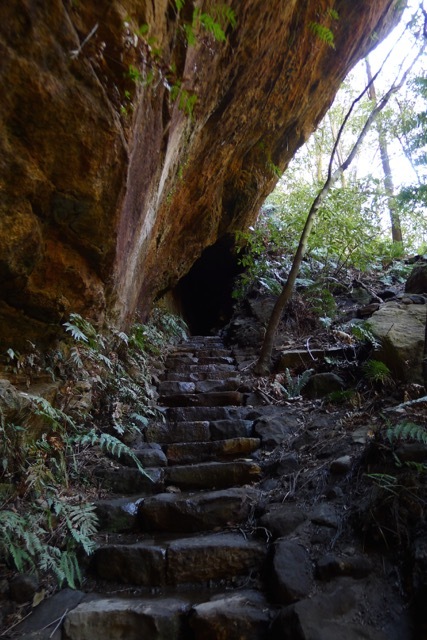 Climbing the stairs between them (here it was steep enough to put in a hand rail and, yes, I gratefully accepted) we emerged back into a eucalypt dominated forest – Blue Mountain Ash. Goodbye to the lush fern and moss adorned rainforests below, and surely, just at the top of this rise – hello Evans Lookout?! Evans Lookout would be just at the top of these steps…surely? But we weren’t there yet. Not until we’d climbed the dirt track up the hill, through the last gate and passed the information plaque (for people walking the circuit clockwise) could we breathe a sigh of relief. And then gasped in amazement, since this was our first look across Grose Valley! Magnificent! However, Evans Lookout is a still bit further on – another ~500m, but fortunately it’s just a gentle incline along the ridge to get there. 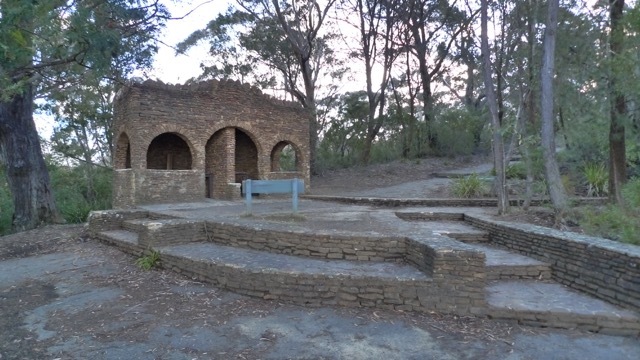 The top of the cliff – was this Evan’s Lookout? Anxious about being too late for a good sight (and photo opportunity), we didn’t dally but hurried along to the proper lookout and – thankfully – managed to arrive in time to snap a few photos in which the opposite cliffs were simply glowing in the late afternoon light. Mission accomplished! Grose Valley, whatever time of day, really is much more impressive than Jamison Valley. The cliffs on the opposite side of the valley are closer, and positioned so even amateur photographers can catch their evening glow. 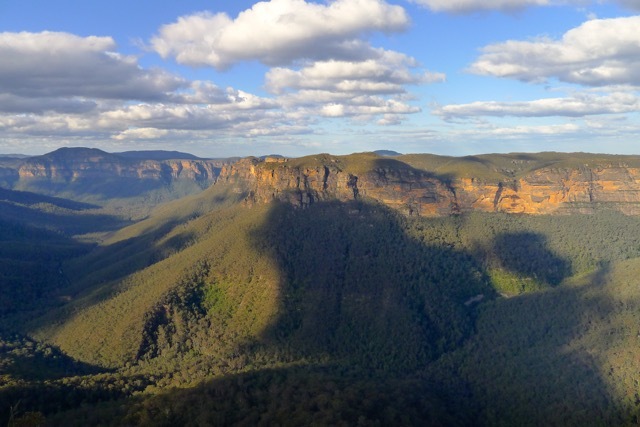 There are many interesting geological formations, walks, and even an impressive waterfall (Govetts Leap) that can be appreciated from a lookout adjacent to a car park – for free! It’s so big it’s hard to capture properly in its entirety, and possibly relief at finally being at the Lookout enhanced my experience, but there’s no doubt that it’s a magnificent location. Photos taken it was time to set ourselves for the last few hundred metres (which felt more like a kilometre) back to the car to complete the circuit. Done! And what a walk that was! I think most amazing aspect of this walk is discovering a completely different and marvellous world so very well hidden and remarkably close to town. 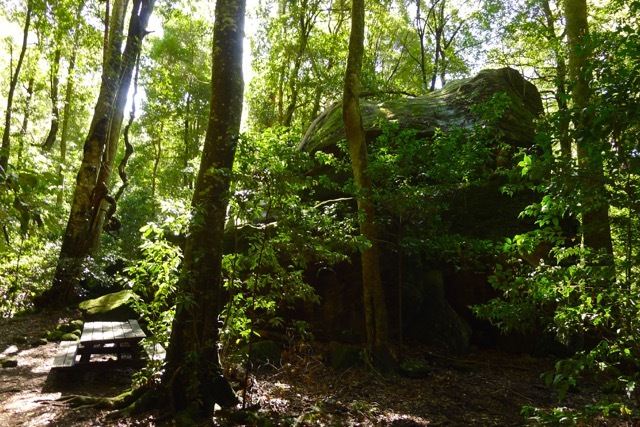 In a relatively short walk you journey from dry, grey bushland to wet, fern-filled gullies, through a deep canyon carved out over hundreds of thousands of years, beneath the canopy of a sub-tropical rainforest, and finally by a small forest of beautiful Blue Mountain Ash. Walking under and past waterfalls, over the creek more times than I can remember, reinforces that it’s water – that most precious of commodities on our dry continent – that created and continues to shape this environment. Even the drops of water falling down from hanging swamps above giving the impression that it’s raining contribute to shaping tomorrow’s Grand Canyon. 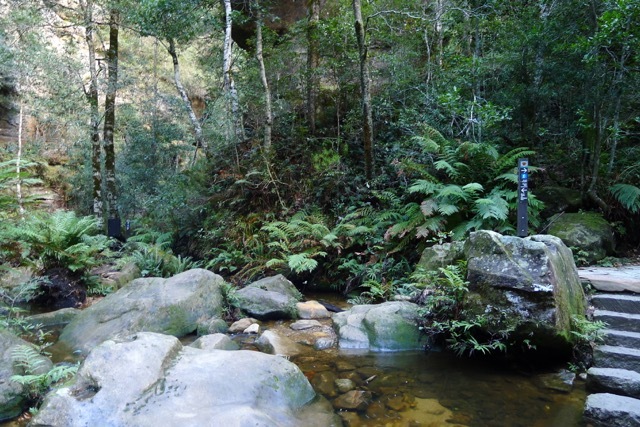 Of course, this route wouldn’t be accessible without the enormous amount of work done by NSW NPSW to map out and create the route, install the small bridge, a few kilometres of handrails and fencing in places, and even more than a couple concrete steps which would have been made on site. 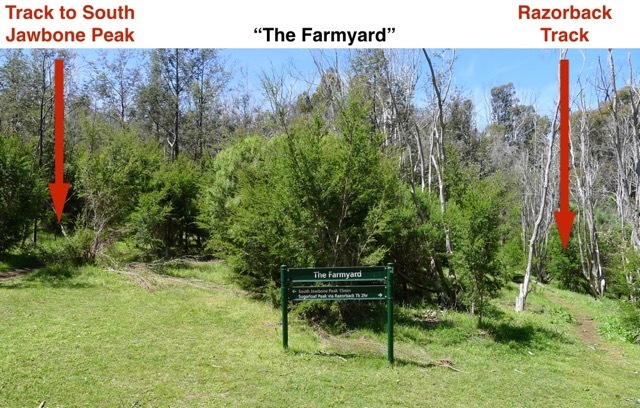 An unbelievable amount of work has made it possible for the public to come and appreciate this jewel in the Grose Valley, and I, for one, heartily thank everyone (past and present) who has been involved in setting up and maintaining these walking tracks. When we return, we’ll definitely be re-visiting the Grose Valley. There’s a lot more to discover here. 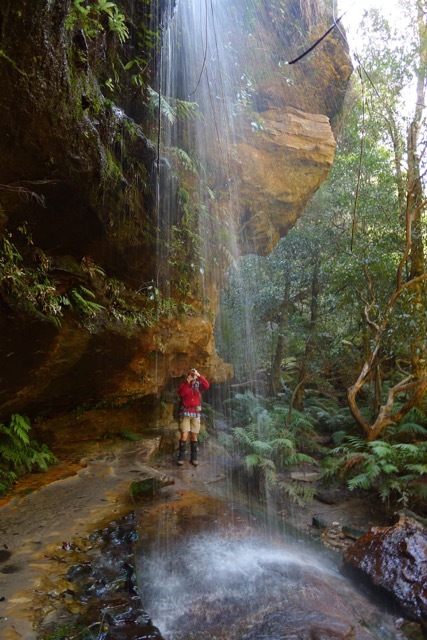 Categories: Hike, Holiday, New South Wales | Tags: Blackheath, Blue Mountain Ash, Blue Mountains, Blue Mountains National Park, Bush walk, bushwalk, bushwalking, day walk, Evans Lookout, Ferns, gorge walk, Grand Canyon, Grose Valley, Hike, Hiking, holiday, mossy forest, NSW NPWS, Waterfall | Permalink. A spell-binding short to half-day walk for bird lovers, nature photographers, or people seeking Shinrinyoku*. 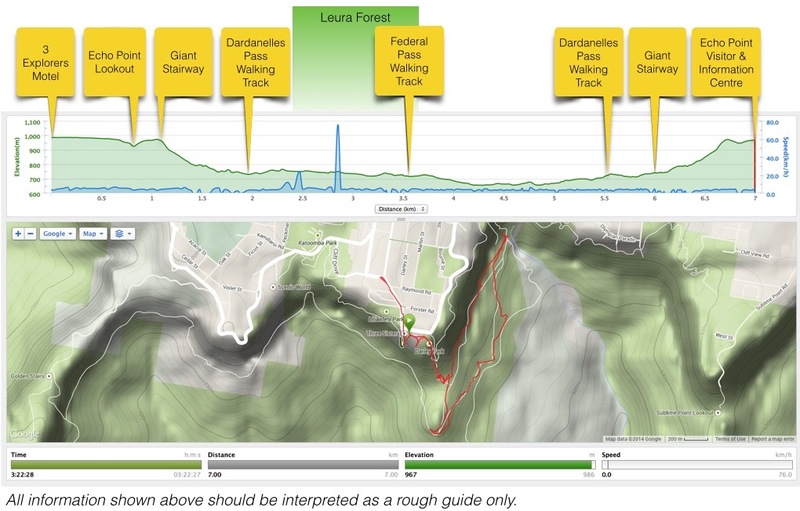 Moderate fitness and an ability to cope with lots of steep stairs required for the walk as described below, however less strenuous options may be available from Leura. *Thanks and credit to Jane for the word ‘Shinrinyoku’ that best describes my Leura Forest experience, and the link borrowed from her Mildly Extreme blog post. Once again, this didn’t turn out to be a fast walk. Not just because I had a camera in my hand (which is my usual excuse, true though it is), but because of (a) the birds and (b) the magic of Leura Forest itself. Feeling positive after yesterday’s walk to Ruined Castle, we wanted to do a really awesome walk on out last full day here. But with so many walks to choose from it was hard to know which would tick all the right boxes. Stephen wanted to walk to the township of Leura, so we set off once more for Echo Point. Where is everyone? You could land a plane here! It was an early start – for us. We were walking by 8:10am which is very nearly unheard of on any holiday where we set our own schedule. Starting out along the Prince Henry Cliff Walk towards the Giant Stairway we spotted a White-browed Scrubwren (Sericornis frontalis) and a couple of Rock Warblers (Origma solitaira) hunting for insects in the leaf and bark litter by the side of the path. A good start to the walk.